June 4, 2018, 11:40 a.m.
Against all odds, Facebook’s Trending Topics lasted more than four years. The company debuted a mostly algorithmic module that pulled in stories posted across the network, based on users’ interests and posts that were getting a lot of increasing attention, in early 2014. This month, Alex Hardiman, Facebook’s head of news products , announced in a blog post that the company will remove the module sometime this week. Hardiman said the box was only available in five countries anyway and drove less than 1.5 percent of the clicks from the platform to news publishers’ sites, “on average.” Facebook is also shutting down any third-party integrations that have been relying on the Trending API. What followed was, as Wired called it, Facebook’s two years of hell, as the company reckoned with fake news, abuse of its platform, and increasingly loud conservative voices crying foul. For Trending Topics, this reckoning first meant losing its human oversight — Facebook laid off all the contracted “news curators” a couple of months after the first Gizmodo story. Its ultimate shutdown this week has been a long time coming. — A breaking news label for the News Feed it’s testing with 80 publishers across North America, South America, Europe, India and Australia, as well as breaking news notifications. — A Today In section focused on local news and community goings-on, being tested in a few dozen cities. Some news organizations based in test cities whose stories sometimes get pulled into the Today In module have told me the stories there are sometimes more than a day or two old, and generate no meaningful traffic to their sites. — News video coming to Facebook’s dedicated “Watch” section in the U.S., where “people can view live coverage, daily news briefings and weekly deep dives that are exclusive to Watch.” These shows are close to launching, according to The Wall Street Journal, and will “likely include content from Fox News and CNN” and will be funded by Facebook and run exclusively on the Facebook. Reality check #1: Babies and puppies videos topped this one analysis of the most engaged native videos on Facebook through May 2018. Among traditional news publishers, ABC News and Fox News each had one video make it to the 100 most engaged Facebook videos. Reality check #2: Facebook paid millions to publishers and celebrities to create a certain amount of live video for the platform; when Facebook stopped paying, the major publishers quickly scaled down their productions. Wang, Shan. 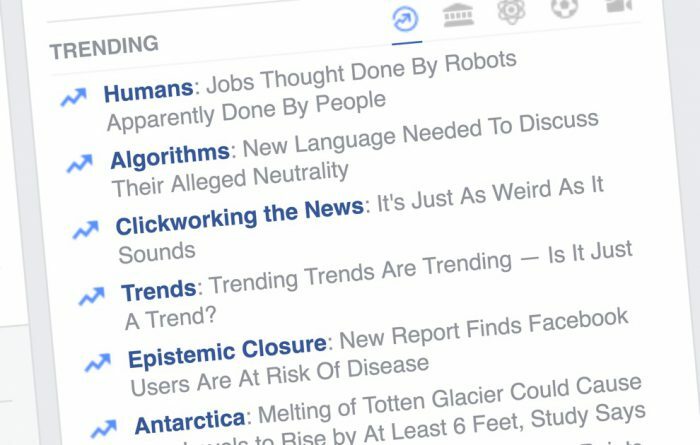 "Facebook is shutting down its Trending Topics for news module. Will any of its new features for publishers last?." Nieman Journalism Lab. Nieman Foundation for Journalism at Harvard, 4 Jun. 2018. Web. 18 Apr. 2019. Wang, Shan. "Facebook is shutting down its Trending Topics for news module. Will any of its new features for publishers last?." Nieman Journalism Lab. Last modified June 4, 2018. Accessed April 18, 2019. https://www.niemanlab.org/2018/06/facebook-is-shutting-down-its-trending-topics-for-news-module-will-any-of-its-new-features-for-publishers-last/. | title = Facebook is shutting down its Trending Topics for news module. Will any of its new features for publishers last?